After several days of eating some (admittedly very good) Mexican-themed food at a conference in Palm Desert, I was ready to have some Asian flavors instead. For some reason, I was craving dim sum, and, unfortunately, there didn’t appear to be any dim sum places in Palm Springs/Palm Desert. Until I searched Google more carefully. Turns out the Supreme Dragon, while being in general your typical Chinese restaurant, has a reasonably good menu of dim sum items as appetizers, including a dim sum platter (shown here). This wasn’t the best dim sum platter I’ve had, but the dumplings were nicely steamed, the sticky rice flavorful, and the meatballs nice an savory. While a real dim sum place with a wide menu would’ve been better, this certainly hit the spot. While Supreme Dragon is overpriced and somewhat limited, a new dim sum location is Legacy Chinese in Palm Desert. Good prices, good basic dim sum–at last. More choices on the weekend than on weekdays, and served from a menu. 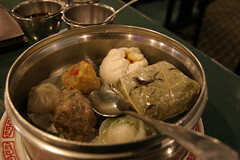 Still, a go-to for dim sum, hard to find in the Coachella Valley. Supreme Dragon does have really good almond duck, and a very good wine list. Thanks for the recommendation, I’ll check out Legacy Chinese next time I’m in Palm Desert.